The atmosphere is packed with dirt and bacteria that the naked eye can’t see but, it is there and we can see the evidence of it on our skin. Along with dead skin cells, the dirt and bacteria that’s carried in the air hits our faces and gets lodged into our pores causing those inevitable blackheads. Whilst we will all acquire blackheads there are products available that will help us eliminate them and steps we can take to avoid blackhead build-ups. By using a daily blackhead face scrub you can reduce your chance of obtaining blackheads by simply keeping your skin as clear as possible. Here I have looked into the top 3 daily blackhead face scrubs and identified the properties that make them so effective. Jadience has been creating products for over a decade, they have gained a wide audience and an impressive amount of credibility. Jadience prides themselves on producing products using traditional, oriental, medicinal herbs which have attracted the attention of many qualified doctors and estheticians who fully back several products including this one. This water-based facial scrub includes ingredients such as jade, ginseng, apricot seeds and kaolin clay. The non-abrasive apricot seeds are used to buff your skin leaving it feeling smooth and soft. Kaolin clay is the best-known material for minimalizing the production of sebum which is one of the main causes of blackheads. It also improves the circulation and is extremely beneficial for dry skin. 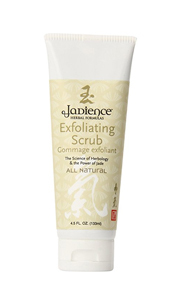 One of the most admirable properties of Jadience exfoliating scrub is the fact that, unlike most products on the market, it doesn’t contain any alcohol, dyes, parabens or phthalates making it completely hypoallergenic. This allows the skin to hold onto its natural oils, instead of stripping the skin it nurtures it. Using this scrub on a daily basis will not only perform a consistent thorough cleanse, removing the blackheads it will also prevent blackheads from forming due to the controlled sebum production it provides. This facial scrub is perfect for those who have oily or dry skin. Neutrogena has an extensive line of products available on the market, from sun care lotions and cosmetics to blackhead freeing face scrubs. The company has a very long history and markets their products to over 70 countries. Their extreme success and popularity have landed them at the top with several of their products. The effects of this scrub are instantaneous although results will significantly improve if it is used once every day. The “eliminating” part, comes from the salicylic acid it contains, once applied the salicylic acid will dive deep into the pores clearing out the trapped dirt and oils. Microbeads softly exfoliate your skin and provide added protection against additional, potential blackheads. 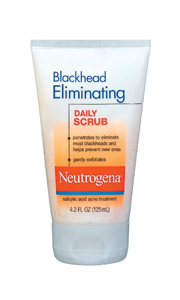 The Neutrogena blackhead eliminating daily scrub is effective yet gentle to the skin making it an ideal candidate for those who have sensitive skin. Apollo Pharmacy is linked to Apollo Hospitals, the biggest healthcare providers in Asia. They have picked up involvement in pharmacy operations and administration during the last two decades and have more than 4000 items available in different sections. With all their experience and knowledge, it’s fair to say, they know what makes a good face scrub. The most interesting thing about this scrub is that instead of using beads, salts or sugars for the exfoliation part, they use walnut shell particles. This minimizes the number of added chemicals and allows the product to be more environmentally friendly. The shell particles still work just as well as the others when it comes to cleaning out the dead skin cells and unwanted dirt, they even help boost your skin making it look more radiant. Another desirable factor that this facial scrub has, is the sunflower oil and apricot kernel oil. By adding these oils into the scrub it enables the skin to become moisturised naturally, again avoiding harsh chemicals that can strip your skin. 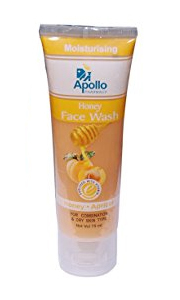 The Apollo pharmacy face scrub has been reviewed as a high-quality product that brightens skin and works quickly to remove stubborn blackheads. It has been noted that this face scrub revives tired looking skin and is effective on all skin types. Why Are These The Best Blackhead Clearing Scrubs? All three of these companies share the fact that they do genuinely care about the health of your skin. They all have extensive knowledge and experience in this field and have researched what people want and how to give it to them, without harming any other factors in the process. Each company has provided people with in-depth information about all the elements that their products are made up of. Making everyone aware of exactly what is going on their skin. These companies are made up of professionals that take the time to research the most beneficial, healthy ingredients to use in their products. Everyone’s skin reacts differently to products whether they contain chemicals or not, even natural ingredients can sometimes be harsh on the skin. The best facial scrub for you depends on what you like and what skin type you have. The best way to determine this is by trial and error. All three of the companies listed above are extremely popular, so you may have already tried some of their products. If you have and you liked them maybe you should try one of the products listed here to see how it can improve your skin. If you haven’t but are looking for a solution maybe one of these products could be your answer. Although all three of these products claim to instantly clear your skin you should still be patient and use them regularly to see just how well they work on your skin. Some blackheads can be extremely stubborn due to a long period of build-up, therefore it will be almost impossible for them to diminish with just one use. The bottom line is, with patience, regular care and experimentation with different products you can dissolve your skin worries.